Two and a half years after leaving the San Juan Islands with our five-week-old baby boy, we are going back for our first visit. 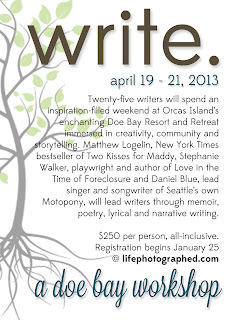 And it is thanks to my friend and fellow writer Jennifer Beck Furber who has invited me to be a part of this new and awesome writers workshop on Orcas Island. 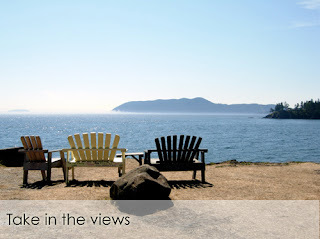 Doe Bay resort is a truly special place on Orcas Island. And Orcas Island is where my midwife and doula live. It’s where we went for our birth class and where I went for all of my pregnancy check-ups. That is to say, it holds a very special place for me. I have vivid memories of sitting on the bench at Doe Bay with Bob, staring out into the water while Malcolm kicked inside of me. Wondering what our future would hold… wondering if we would ever get to come back. Back in October, Bob went to Nasheville for a bachelor party weekend to see the Bears play. That was his first weekend away as a dad. Though we are all traveling to the islands together (Bob, Malcolm and me,) the time at the writer’s workshop is my own. Bob and Malcolm will be staying with Jenn’s husband Luke and their three girls (Malcolm will love them!) while I enjoy my first weekend away as a mom… to BE a writer and be with other writers. Bob got BBQ, beer and the Bears, and I get hot springs, writing and storytelling. I couldn’t be more thrilled. If you’re a writer and long for a weekend away from it all… truly away from it all… to have some intimate time with your work, then this might be the workshop for you. The group is limited to 25 and tickets go on sale HERE on January 25th. More info about the weekend here.